Well, it's officially less than 12 hours until I head out with the Tour Divide with the hope of pedaling along 2,700 miles of the Great Divide Mountain Bike Route. Canada to Mexico. It's an impossible concept to swallow right now, so I hope to find the strength to bite it off in small but consistent chunks. A bike mechanic in town graciously gave my bike one last once-over and everything's good to go. It's not ultralight, but it's comfortable and strong, and the things I'm taking keep me comfy and happy. I feel good about it, and anything I get sick of hauling I can always throw away later. Against the advice of most fast GDR and Tour Divide veterans, my race strategy is to have no strategy. I have a few tentative goals for the first couple nights, but my plan is to be completely flexible. If I push myself to hit rigid goals, I'm going to end up pushing too hard and will likely end up frustrated and burnt out. If I only make it 30 miles one day because I got a few dozen flats or hid from a hail storm, so be it. I plan to start out at a really mellow pace and, after a few days, make adjustments once I start getting "in shape." I plan to eat as much as I can put down and recover every night with lots of sleep. If I can stay healthy, there will be plenty of time later in the race to go fast if the old body and mind will allow. Bikepacking forum, where there's sure to be spectator chatter: http://www.bikepacking.net/forum/index.php/board,2.0.html. Thanks for reading. By grace go I into the Great Divide. Best of luck to you. Really. I hope this is your best journey yet. All (wo)men dream, but not equally. Those who dream by night in the dusty recesses of their minds wake in the day to find that it was vanity: but the dreamers of the day are dangerous (wo)men, for they may act their dreams with open eyes, to make it possible. Good Luck. I would like to think if I ever did such a thing, I would take the same approach. Thanks for keeping us up to date and providing all the links to the race. Good Luck! Wishing you the best of luck. Enjoy the ride! Be safe, have fun and good luck! Sure sounds like a great plan...without being smoked in the first week who knows where your drive will take you in the 2nd half??? Just keep those extracurricular activities in check, OK? 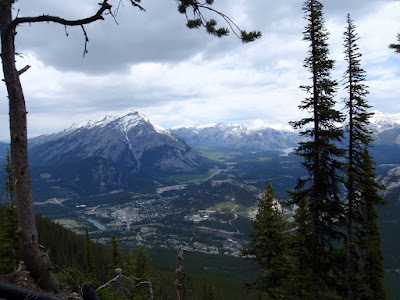 I looked at the leaderboard yesterday and while most TD racers were chillin' in Banff, you were on top of some mountain SW of town!!! Nutter. Have a great ride and thanks in advance for the peek'n. Shiny side up, rubber side down, turn the pedals and go. Have a blast... we're all here with you every turn of the cranks. The wheels on the bike go round and round - you will be there before you know it. Have fun! And say hello to my brother Joe (Meiser) if you see him! He'll be riding the big ugly green fargo (and by ugly I mean awesome). Awesome!! Have fun and enjoy your moments! Take that fired up, revitalized and happy you onto the tour and ENJOY. It's going to be an awesome adventure. Thanks for coming to join us in our Paradise in a Bubble. We sure love it. And we've been looking for a name for our tandem. Maybe we should namer her Jill? Best of luck to you! May you be safe and happy. I'm hoping the Peek works, because I'm so looking forward to reading your story as you go! I am about to start the Race Across South Africa on Monday. It is 2300km mid winter and my mantra is: How do you eat an elephant...one bite at a time. I have no doubt you will eat your elephant bite by bite. Good luck, Jill! Sounds amazing...ly tough. Be safe. One can't take a breath large enough to last a lifetime; one can't eat a meal big enough so that one never needs to eat again. Similarly, there are such values as warm friendship tested and strengthened through shared danger, the excitement of obstacles overcome by one’s own efforts, or the beauty of the high, quiet places of the world. But these values can’t be stored like canned goods. They may need to be experienced, lived — many times. Be safe, and take it all in! Enjoy the Divide Jill! Looking forward to your updates and call-ins. Keep smiling, keep turning those cranks and we'll see you in Mexico! Kick it Jill...you're going to do great. Fun first, all else later. So impressed by all you have done. So looking forward to hearing you tell the story of this adventure. In the words of Warren Zevon, "enjoy every sandwich." Your "plan of no plan" sounds perfect. The trail will give you all you need. go jill go! i love watching the spot. :D technology rules. Good luck sister! You will do great. I love you! Massive props to you Jill. Let's see: a little snow and cold feet in AK-you pull out. Here? a squeeky chain and wheel out of round and you'll be headin home to your abandoned cats! I like your "no strategy" plan. Ride well! What a great project!! This is Troy from way back when... Best of luck with the race. Incredible. I like the no plan-plan.